Central University of Jammu organized a one-day workshop on 9th April 2018 to observe ‘World Health Day’ which was celebrated worldwide on 7th April 2018 in Temporary Academic Block (TAB), Sainik Colony. This year’s theme of ‘World Health Day’ was ‘Universal Health Coverage: Everyone, Everywhere. The objective of organizing this workshop was to provide awareness regarding various health issues and health services available at the global level which can be utilized for the service of the humanity to improve living standards and quality of human life. Honorable Vice Chancellor Professor Ashok Aima was the chief guest of the workshop. The distinguished guests were established medical professionals as well as reputed faculties in Government Medical Colleges and Acharya Shri Chander College of Medical Sciences including Dr. Rajesh Gupta (Professor and Head, Department of Orthopedics, ASCOMS). Dr.Shashi Soodan (Professor, Department of Microbiology, GMC Jammu), Dr. Vishal Tandon (Associate Professor, PG Department of Pharmacology and Therapeutics, GMC Jammu), Dr. Sachin Gupta (Assistant Professor, Department of ENT & Head and Neck surgery, ASCOMS) and Dr. Rashmi Gupta (Eye Specialist, Police Hospital Jammu). 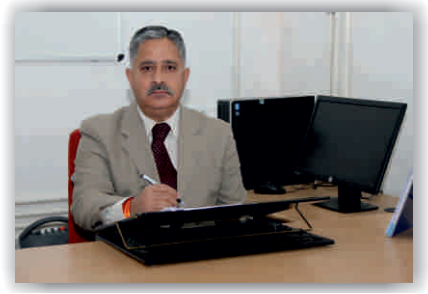 Professor N.K Tripathi (Dean, School of Life sciences) presented the welcome address. Keynote lecture was delivered by Dr. Rajesh Gupta delivered his talk on Lower Back pain. Dr. Shashi Soodan gave the lecture on Health for all. Dr. Vishal Tandon stressed on the role of hypertension and healthy life style. Mr. Pranav from ICICI mutual funds created awareness about financial health programme. Honorable Vice Chancellor emphasized on the importance of adopting a healthy life style and good dietary habits. He presented the mementos to the invited guests. Mr. Shakti Ranjan and Mr. Lok Nath won the prize in the section of best pamphlet designing. Ms. Harsimerpreet Kour received award for designing poster. In the section of Healthy food recipe competition, the first prize winners were Ms. Pritika Singh, Ms. Kavya Dubey and Ms. Nikita Chauhan. Second prize winners were Ms. Kanika Sharma, Ms. Swati Gujral and Ms. Anuradha while third prize was won by Ms. Supreet kour and Ms. Akanksha Sharma. Dr. Shelly Sehgal, Assistant Professor, Centre for Molecular Biology presented the formal vote of thanks. Free medical camps of ENT, Eye and Orthopaedics were well attended by Faculty, Students and non-teaching staff of the University.